This Nativity from El Salvador has 5 hand-painted figures using brown and gold colors on pine wood. 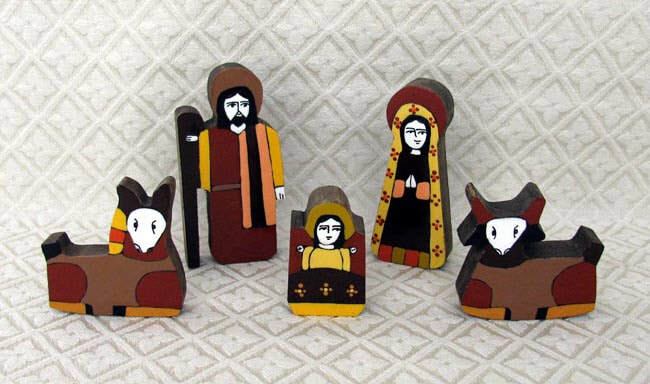 The figures include Joseph, Mary, baby Jesus, a donkey, and a cow. The Joseph figure measures 3.5 inches tall. The set was handmade in the mountain village of La Palma, El Salvador, famously known as the “Artists’ Capital” for its multitude of artisans and distinctive, colorful painting style, and also as the “Cradle of Peace” for the city’s role in the peace talks that ended El Salvador’s long civil war. The scene was designed by master artisan Aminta Flores de Mancia. As of 2010, Aminta employs twelve full-time artisans and twenty-two part-time painters to meet the worldwide demand for her creations. Best of all, her children work at her side to manage every aspect of the business. $25. Please click here for purchasing instructions.